Welcome to The AFA Podcast Episode 21! It's very much a show of two halves this week. In the first part, Chris, Dan, Rachael and Yvonne talk animation news, including the Annie Nominations, Only Yesterday's US details, the return of Samurai Jack and more. 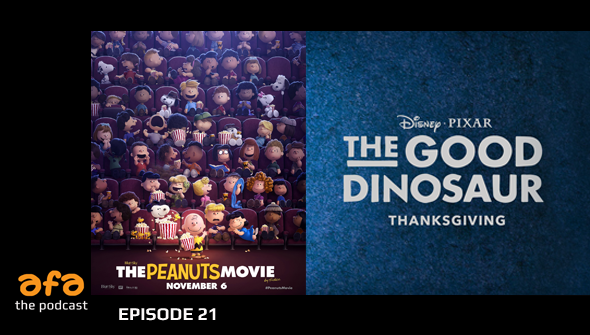 Then in the second half, Rachael and Dan discuss the last two major animation releases of 2015, Pixar's The Good Dinosaur and The Peanuts Movie. Listen to the episode here, or find us on iTunes, Podcasts.com and Stitcher. If you like the show, don't forget to subscribe via the method of your choice, and why not leave us a review? They can really help others discover the show! Want to send us a message, question or suggestion for a future show? Email us here. If you'd like to advertise or sponsor a future episode then please drop us a line right here.